Period-style bathrooms are elegant and give us an alternative to the sharp lines and dark colours found in modern bathrooms. With deep soaking tubs, clean tiled surfaces and exquisite fittings, period-style bathrooms offer a sanctuary for people who are looking for something different for their home. 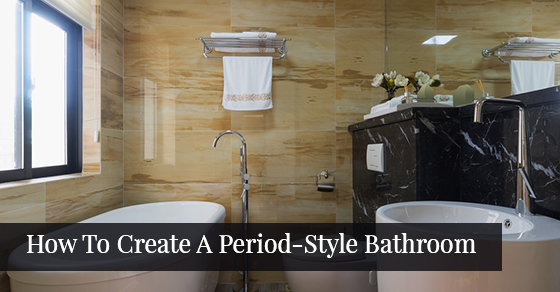 Period-style bathrooms are known for their romantic flair and colour schemes. To give the bathroom walls a touch of romance, opt for Venetian plaster in shades of greyish blue. To achieve this look without re-plastering your walls, try 3D paint that allows you to craft a Venetian plaster finish. While in most modern bathrooms you’ll find tiles that cover the walls and floors, in the Victorian era, the floors weren’t tiled. Instead, they used painted floorboards. However, they weren’t exactly waterproof. With wood-effect vinyl flooring you can get that period-style elegance without sacrificing utility. Stained, water-resistant flooring is available that looks like it was transported right out of the a house from yesteryear, except it won’t get ruined if you accidentally splash water on it. You can also try basket-weave tile for your floors if wood-effect vinyl isn’t your thing. Basket-weave tile creates a gorgeous mosaic that can be painted period-correct colours so you don’t sacrifice that Victorian grace. The final touch for any period-style floor is a Persian rug to give an added layer of warmth for our precious toes when we step out of the tub or shower. In the olden days, clawfoot tubs were found in every bathroom. Now, we don’t always have the time to take a soak and need the convenience of a shower. With a period-style bathroom, you can have both. Try a frameless shower enclosure that will complement your bathroom’s overall period aesthetic. If you don’t have the space for a separate shower, add gold or brass cross-handles and a ceramic-accented handshower attachment to your bathtub. To keep with the period-style theme, choose a frameless mirror for your bathroom’s vanity. Go for the traditional bevelled shape that was popular in the Victorian era but add the modern convenience of lights behind it so you can see yourself when you brush your teeth. Bathroom renovations should not be undertaken on your own. It’s important to hire a qualified team of construction professionals to help you achieve the period-style bathroom you’ve always wanted.